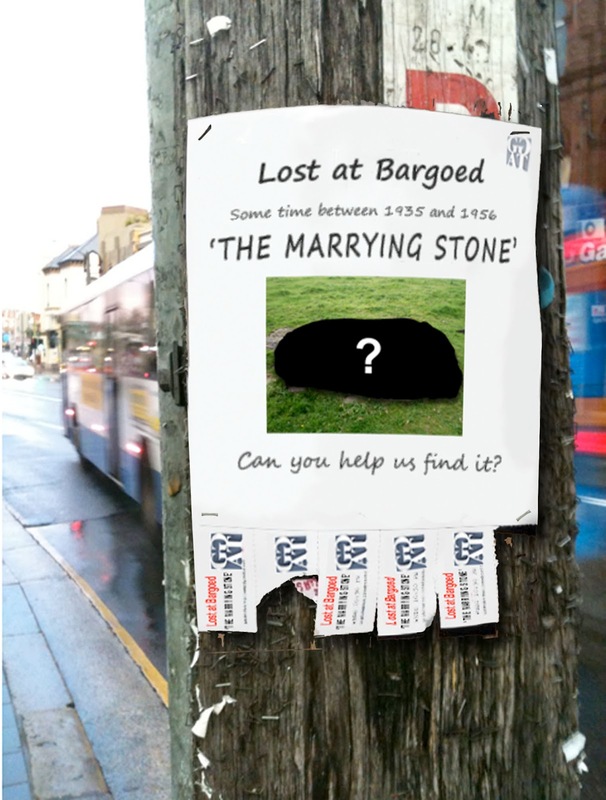 GELLIGAER ROCK ART PROJECT: LOST AT BARGOED! In 1949, the archaeologist Lady (Aileen) Fox, the wife of Sir Cyril Fox who was the Director of the National Museum of Wales, wrote a letter (probably to OGS Crawford, the head of the archaeological division in the Ordnance Survey). In it, she mentioned a cup-marked stone that had been found in an allotment in Bargoed, and was known locally as ‘The Marrying Stone’. Cup-marked stones were created during the Neolithic, or New Stone Age (roughly 4400 - 2300 BC). Using pointed stone tools, Neolithic people dug out circular depressions a couple of inches across on rocks that were softer than the tools. There might be just one cup-mark or there might be a group of several of them. The rocks might be natural outcrops or they might have been moved by humans, perhaps to become standing stones. Cup-marks are the commonest rock art motifs found in prehistoric Britain. Although rock art is common in some parts of Britain, such as North-east England, it is very rare in Wales. 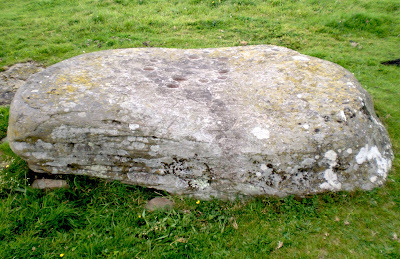 However, one cup-marked stone, called Maen Cattwg, can be seen near a footpath in fields just outside Gelligaer village. And in the summer of 2011, another cup-marked stone was found on Gelligaer Common. Learn all about this find. 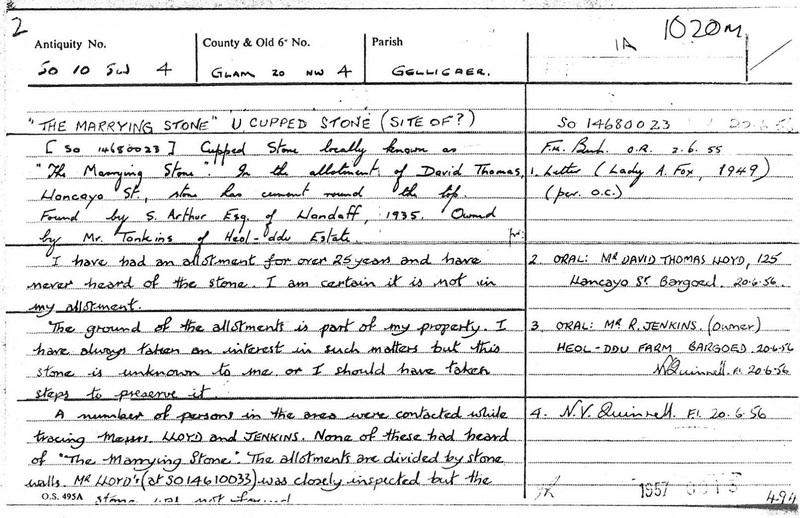 Above is all the information we have at the moment about the Marrying Stone. It was written down on an index card by an archaeologist called Norman Quinnell who worked for the Ordnance Survey and was responsible for carrying out an archaeological survey of South Wales in the 1950s. His writing is not very easy to read so we have added a transcription. None of the people he asked when he visited Bargoed knew anything about it. Do you? We don’t even have a clear idea about what it looked like, although when Lady Fox saw it, it had cement around the top suggesting that it had been built into a wall. It could just have been a chunk of stone with cupmarks. Or it could have been a large rock the one in the photos, with one or more cupmarks on it. 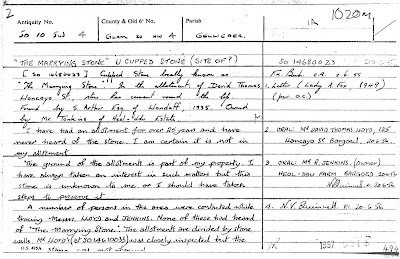 The stone was found nearly 80 years ago, so anyone still alive who was around then was most probably a child at the time. Or there might be people who have been told about it by their parents or grandparents. The name ‘The Marrying Stone’ suggests that there might have been traditions about it connected with weddings. Have you heard any of these?